As a newbie blogger I don’t really expect a whole lot of people to be reading my blog apart from my close friends and family but recently I have been feeling really pleased as its reach has started to extend a little beyond that and even beyond my own British shores. It is lovely to feel part of a supportive and welcoming group of people and I feel like I have already found that in the blogging community. It was from this lovely group of people that my nomination for a Liebster Award recently came, this was a complete surprise and I was super excited when it happened, my thanks go whole-heartedly to my nominator Amy over at MakeAmyMake. 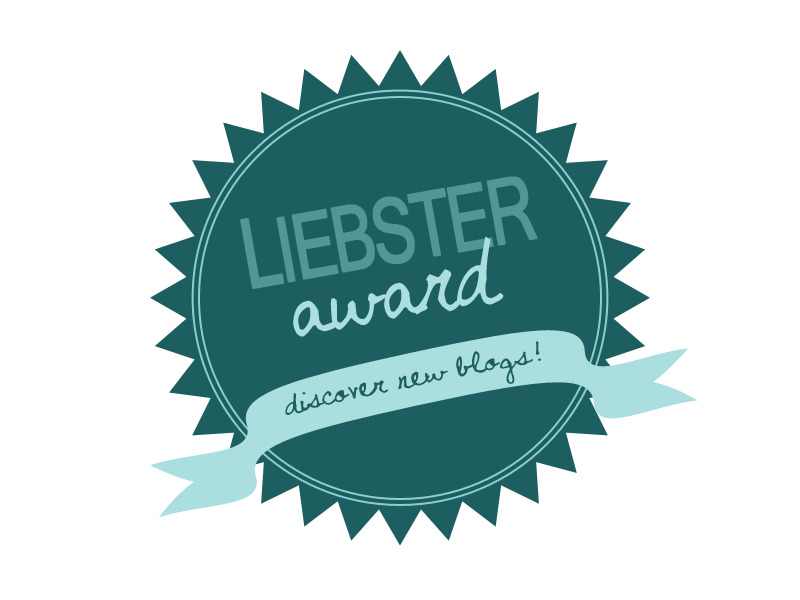 The Liebster Award is a way of bloggers recognising other bloggers, giving them a virtual ‘pat on the back’ for their efforts and recommending their blog to others. It is a lovely concept which I am pleased to be part of and am happy to answer the questions Amy has set for me – perhaps you’ll get to know me a little better through them too. If you had a “craft super-power” what would it be? If I had a craft-super power it would be to be able to extend the number of hours in the day (a kind of time-travel I suppose) so that not so many late nights were spent finishing a project! What is your favourite time of year? My favourite time of year has to be the Autumn. The American poet William Cullen Bryant sums it up perfectly when he said it was ‘the year’s last, loveliest smile’ and it is through the wonderful array of colours and beautiful evening light that I find my happiness at this time of year. It is also a season which holds fond memories for me as it is when my husband and I chose to get married. What was your favourite project and why? My favourite project so far has to be my ‘London Calling’ cushion, it is my first commissioned piece and I loved creating a bespoke item which I know will be treasured. What one new technique would you like to learn and why? I would like to improve my free motion machine embroidery skills and as well as continuing to create pieces I am also hoping in the new year to attend a workshop with the super talented Katie Essam who I met recently at The Handmade Fair. What’s your least favourite part of the creative process? I think cutting out pattern pieces is probably my least favourite part of a project as it requires a steady and precise hand which I do not always have. What is your craft space like? Tiny, it currently is a combination of the dining room table and a couple of cupboards in the living room. I dream of an organised craft room which I hope will become a reality within the next year. Do you have a favourite place? I am definitely a country girl, not a city slicker and anywhere that is green and where I can be close to nature is my favourite place. Whilst I can’t pick one place in particular I love to spend time walking in the woodland, strolling by the river or ambling round a local park. Have you ever considered turning your hobby into a career? Definitely, I would love to be able to spend more time being creative and really enjoy creating pieces for others so making a career out of it would be an absolute dream. Do you have a favourite blog, store or site? My favourite blog has to be ‘Mrs Bishop’s Bakes and Banter‘ a lifestyle blog written by the lovely Lucy Bishop, a fellow Bedfordian and my blogging inspiration. As a business/store, I have been really inspired by Ellie’s Beautiful Mess not only for it’s wonderful products but also for the way the super-talented Ellie has developed a strong brand and built her success in such an organic way. If you had to choose a favourite fabric, what would you choose? I don’t think I have a favourite fabric as such but I am quite picky about the quality of materials I use so would probably say anything that is a joy to touch and is not made from a manufactured material would be high on my list. What city do you think represents your style? Not sure it represents my style but after visiting last year I fell in love with San Francisco, it has such an awesomeness about it, the people were friendly, the lifestyle was outdoorsy and the landscape in both the city and along the coast line was beautiful – I can’t wait to return to sunny California. A lovely part of this award is that I now get to nominate some blogs that I love and which I urge you to also take a peek at as they are awesome. KitchenTableSewing – the lovely Janet is the person around who’s kitchen table I learnt to sew, her blog is a delight to read sharing a combination of life with her four beautiful girls, her own sewing adventures and what happens round her kitchen table where she teaches others to sew whilst serving her delicious homemade cakes! Ellie’s Beautiful Mess – as I already mentioned Ellie is a business inspiration to me, her felty crafting business had humble beginnings but almost a year later has blossomed into something truly beautiful. Her recently started blog offers advice to any budding creative business people as she reflects on her experiences over the last year. Red W Sews – like me Becca is a newbie to sewing and I am really enjoying following her progress and getting inspiration from the projects she undertakes. I have serious stitching envy over her recently made Grainline Morris blazer, you must take a look, it’s such a great make. Acknowledge the person who nominated you and link back to their blog. Nominate up to 11 blogs with less than 200 followers that you enjoy. Set 11 questions for your nominated bloggers to answer. Let the nominees know they have been nominated by going back to their blog and notifying them. How long have you been creating/crafting for? What do you enjoy most about the creative process? What was the latest skill or technique that you learnt? What is your ‘secret weapon’ – a piece of kit you couldn’t live without that others may not know about (if you’re willing to share)? What do you enjoy doing when you’re not being creative? What is your ambition for the future (personal or creative)? If you could choose another era to live in what when would it be and why?